Tempe, Arizona, January 12, 2010 – USTA Central Arizona hosted a QuickStart training at Tempe Escalante Center for 65 people on Tuesday. The QuickStart training was designed to educate the fifty plus Kid Zone site coordinators as well as USTA Central Arizona After Schools Tennis Instructors on the QuickStart curriculum designed by the USTA. Jason Jamison, USTA National Manager of Schools Tennis, led the three and half hour training. He took the instructors through the various skills and drills that will be used to introduce tennis to children ages 5-10 years old. The training also included a nutrition component for the instructors. They learned how to integrate health and wellness into the QuickStart curriculum when they are teaching the kids about tennis. USTA Central Arizona has partnered with the City of Tempe and their after school daycare program Kid Zone with the goal of introducing tennis to all the children of their nineteen schools. This partnership will expose approximately 400 new children to tennis, “the sport of a lifetime.”	In addition to training all of the Tempe Kid Zone staff, USTA Central Arizona will be providing equipment to the schools so they can successfully deliver the program to the children. The goal of this strategic partnership is to give every child the opportunity to play tennis and feel like they are part of a team. QuickStart tennis stresses the importance of play and team competition. 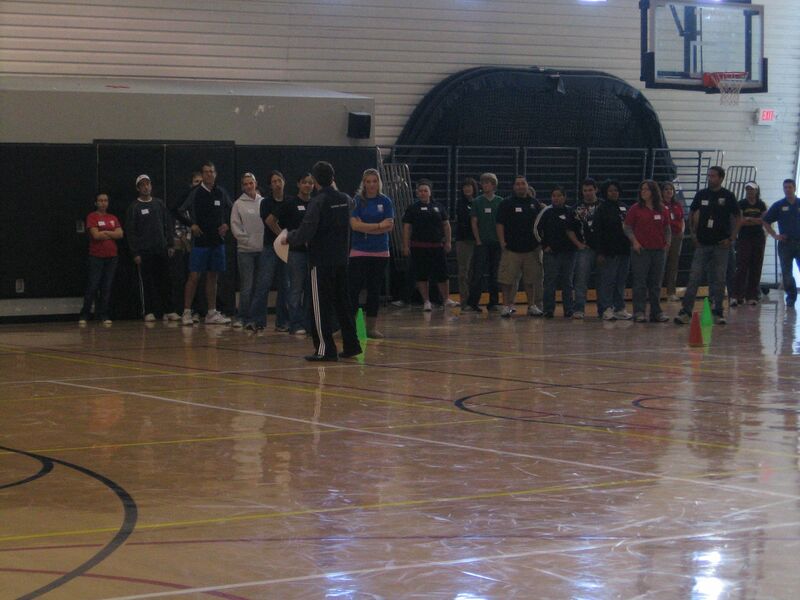 The remaining attendees were instructors that will be teaching in the USTA Central Arizona After Schools Tennis program. Currently, Central Arizona is working with seven school districts (including the City of Tempe) to introduce tennis to young children. Fall 2009 was the launch of this program. In the first three months of the program the After Schools Tennis Program introduced tennis to over 400 children. These children participated in a six week class where they learned the basics of tennis. At the completion of the 6 week program, they were invited to participate in a tennis carnival (three tennis carnivals were held around the Greater Phoenix Area), where they competed on teams, hit for targets and played in QuickStart Tennis Tournaments. USTA Central Arizona is now in the process of launching its first season of QuickStart Jr. Team Tennis. This gives the kids the opportunity to use the skills they have learned in the after school program and compete as part of a team for their respective schools, creating a strong camaraderie amongst the kids. The goal of the QuickStart After School Program is to reach 1000 new children during the course of 2010 in the seven school districts. Inside each of the seven districts, QuickStart Junior Team Tennis leagues have been established, and the program will be launched at the beginning of March. “The partnership we have developed with the City of Tempe will only benefit the children of this program. Giving all of their instructors the ability to introduce tennis to these young children is key to the mission of our organization. We would not have been able to give these children the opportunity to learn this great sport on their school campuses without QuickStart Tennis. "Our after schools program has grown faster than we ever imagined,” said Geoffrey Russell, Managing Director of USTA Central Arizona. QuickStart tennis is a new play format to help children learn how to play the game of tennis with age and size appropriate equipment. QuickStart tennis includes six specifications, including age, court size, racquet length, ball weight and speed, net height and scoring format. This enables youngsters to practice and	play real tennis to scale and allows them to play and learn at the same time—as opposed to the traditional model of learning skills before playing the game. Since rallying and playing is much more fun than standing in line, children will want to continue to learn the game and develop the skills necessary to play with their friends on a team. United States Tennis Association developed the QuickStart curriculum to help make tennis more enjoyable for the kids. What makes tennis fun is being able to rally a ball back and forth over a net with a partner. The sooner the youngsters can rally, the sooner they can actually play the game and participate on a team. The curriculum was designed to give coaches and parents who work with children at the beginning stages of development the necessary tools to get children playing the game during their first practice—tools such as simple lead-up activities and ways to modify the court, net, racquets, and balls.